The other Saturday urban planner Ruth Miller led about 50 people (and one dog!) 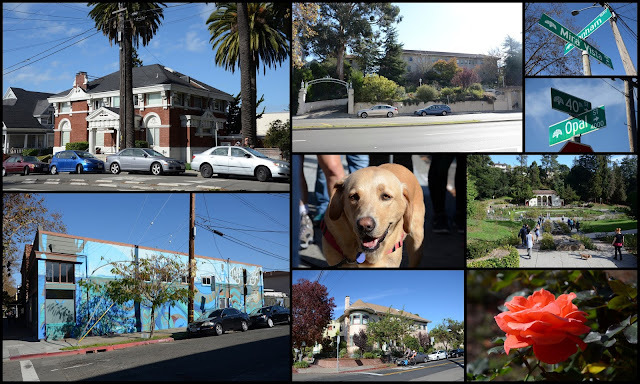 on an Oakland Urban Paths walk exploring some buffers and boundaries in Oakland. We started the walk at MacArthur BART with option return by AC Transit bus, making it easily the most transit-friendly walk we’ve done. At MacArthur BART we looked at the transit village that’s in progress; the BART parking and housing on BART property is completed. From there we meandered above and along 40th Street, talking about transit past (Sacramento Northern Railway, Key System) and present (AC Transit, bike super-sharrow). A special thanks to Ruth for her upbeat presence in leading this hike. I, for one, was in post-election doldrums before venturing out the door that morning. Ruth wisely set down some ground rules–exercise, fresh air, and no talk of the election! It worked–I re-entered the land of the living in community with my fellows on that walk. Thank you Ruth!